Vice President Joe Biden toured the damaged New Jersey shoreline. 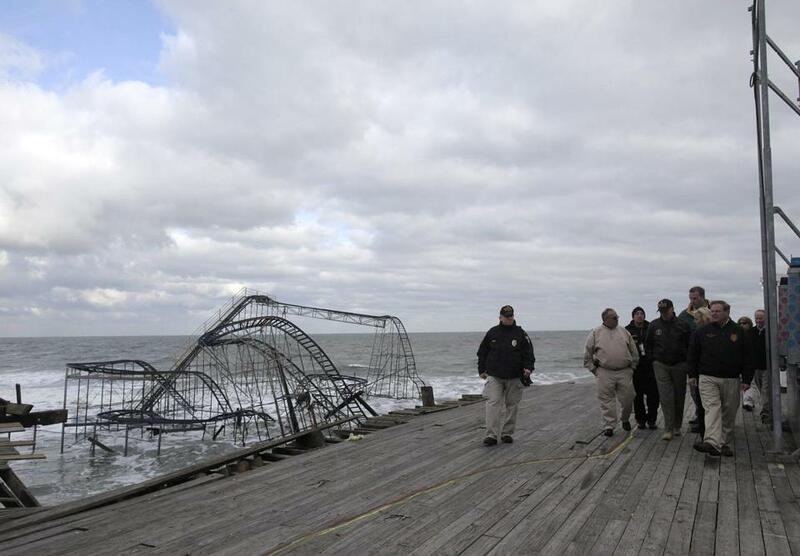 Despite causing damage throughout southern New England, Hurricane Sandy saved the bulk of its destruction for New Jersey and New York. Many homes, roads, subway tracks, and power lines could not survive the rush of water. Massachusetts may not be so lucky next time. It may just be a matter of time before the dual consequences of rising sea levels from the melting ice cap and massive “surges” from powerful storms wreak havoc on Boston, a city that was built on land-fills. The devastation in New York and New Jersey should refocus Massachusetts policy makers on the regulations, public investments, and adaptation measures necessary for protection in an era of climate change. The East Coast of the United States is experiencing sea-level rises at a greater rate than the rest of the world. By 2100, the sea level will have increased by 1 to 4 feet, depending on estimates, impacting individual stretches of coastline in different ways based on geology and ocean currents. Add into the mix hurricane-force storm surges, and the danger of widespread flooding is obvious. In Boston, the saltwater alone could severely damage the T. Mold and bacteria left behind would put public health at risk. The flushing of sewage systems would make swimming in the ocean dangerous because of increased bacteria levels. Protecting against floods isn’t easy. Logical-sounding responses like building higher sea walls aren’t as simple as they seem; they merely divert water to wherever the sea wall ends. As new building continues in South Boston and the Four Point Channel, harborside expanses that are likely to be vulnerable to major storms, flood planning should no longer be a work in progress. The first step should be to accelerate risk and vulnerability assessments. This is an ongoing effort that started with Boston’s Climate Action Plan, and has been aided by the Green Ribbon Commission and other private-public partnerships. But state and city officials still need a clearer sense of which forms of infrastructure are most exposed, and which need to be shored up most quickly. Protecting central subway lines and supplying emergency generators to hospitals should benefit the highest numbers of people in the shortest period of time. The second step should be to devise a thorough game plan for the days and hours before a major storm. A quick, sensible set of precautions can save many lives and billions of dollars. Long before Sandy struck, New York City authorities had a checklist of when to close public transportation and other critical infrastructure to protect it from onrushing water. That helps to explain why much of New York’s subway service was restored so quickly. The final step is to build a resilient city. Potential climate impacts must be fully integrated into design plans. Building codes should be updated for possible flooding, which would require moving electrical panels upstairs from basements and placing restrictions on ground-floor uses. In many respects, it is too late for Boston to avoid the combined impact of rising seawater and severe storms. The question now is simply whether the city will be able to respond and adapt quickly. The short answer is: Not yet, but there’s still time to get it right.